ExoticSkis.com is the World's largest collection of links, information and independent tests about 441 small, obscure, unknown, little-known, unique, independent, microbrew, craft or just plain bizarre skis, ski designers, ski companies and custom ski manufacturers from around the globe. Support your small, independent, craft ski builders! The "mega" ski companies such as Atomic, Rossignol, Dynastar, K2, Fischer, Volkl, Elan, Head and Nordica and others have captured the bulk of the skiing public's attention through media saturation and brand recognition on the slopes using millions and millions of dollars of marketing efforts and they dominate the racks at nearly any ski shop. They make some great skis, but other brands are out there...maybe built in your neighborhood or near your favorite mountain by a crafty group of people you'd like to meet. Mass-produced skiers use mass-produced skis. Rip it up with something different. Since 2005, ExoticSkis.com brings these alternatives to you. Intriguingly unusual or different; excitingly strange; strikingly or mysteriously different or unusual..
ExoticSkis.com available in 70+ languages! Mark Farner is a former Worldcup snowboard competitor and member of the Swiss Snowboard Federation who has assembled a team of craftsmen to design and construct high-quality skis and snowboards in Zurich, Switzerland since 1984. Radical is a super-passionate, small-batch ski and snowboard company dedicated to intensely well built products incorporating the best materials the designers can find. They stand behind their products with a 5 year flex and camber warranty...something we have never seen before. Radical represents a superb example of high-quality ski and snowboard fabrication aimed at intensely effective high performance in a premium product. In Europe, the piste-carving ski remains one of the primary staples for skiers at neary any mountain, even with the prominent rise of the rockered, wider freeride ski designs of the last ten years. If you visit any lift-serviced ski area, the majority of skiers will often be riding dedicated frontside carving skis. Since the ski racing cutiure is so strong in Europe (some argue it is much stronger than in North America), race-like skis for the masses are extremely popular, but full-on FIS-compliant race skis have too large a radius and are too demanding for civilians and carving enthusiasts who need something to produce intense carving behaviors without requring Olympian-level stamina and conditioning. These conditions gave rise to the Euro-carving ski designs which display typically race-like grip and response in a more forgiving chassis with tighter radii. Race ski componentry often makes its way into the Euro-carver or "Race Carver" layups in more friendly proportions. Technical carving enthusiasts, instructors and ex-racers tend to love these designs allowing the skier to execute intense angle carves at less than race speeds, yet ski all over the hardpack runs all day without feeling punished by an overly-demanding design. The Radical Race Carver, like similar skis from RTC, AK-Ski, Kessler, Mach, Blossom and other Euro brands, uses race-quality materials and layup expertise in geometries more suited to technical carving at less than race-like speeds on water-injected race course surfaces. Radical's Race Carver is a stunning example of how a somewhat softer-flexing ski can deliver impressively accurate, intense carving performance. You can ski it relatively slow and easy, or use intense edge angle and pressure inputs to get a slot-car-like grip and turn response in a lightning-quick manner. What's really interesting is the unusuall lightweight feel underfoot. Normally, a ski with abilities to dig intense carving arcs into the snow at moderate to high pressures feels like it weighs like a race ski. Radical's Race Carver feels wonderfully light underfoot due to its carefully proportioned materials. Radical is demonstrating a state-of-the-art carving ski design and construction prowess with traditionally excellent Swiss craftsmanship and quality. Why would more than a dozen ecologically-friendly ski and snowboard wax companies sprout up over the last few seasons, and why would the big wax companies develop lines of non-fluourocarbon, eco-friendly waxes that seem to sell well over the same timeframe? While the speed-related effects of flourinated waxes are well known (and still intensely expensive), the detrimental effects upon the environment and the people applying these waxes are becoming well documented as well. Groups ranging from grade school athletic departments, to ski academies, to European ski associations and environmental regulatory bodies are increasingly restricting the use of fluourocarbon-infused waxes because of their detrimental health and environmental side effects. As it should, the ski wax industry has responded with new products and companies striving to provide ecologically-responsible, biodegradable, non-fluourocarbon was products for recreational and competition use. We discovered Richard Beneduci's Green Ice Wax company back in 2014, and asked if we could test some samples of his eco-friendly, no-fluouro formulations, including a fully biodegradable wax created without petroleum-based paraffins. We found the wax worked as advertised, gave us excellent sliding and durablity performance while being super eco-friendly and had a price point right in line with so-called "conventional waxes." We liked the product enough to ask if Green Ice would sponsor some wax for our ski testing program, and bingo....we've been using it in all kinds of conditions ranging from filthy slush to rock-hard boilerplate and hyper-cold powder snow for the last 4 seasons and put the logo badge on our web pages as a sponsor. If we didn't like the wax or thought it wasn't a good value for skiers, we wouldn't use it at any price. Period. We like using an eco-friendly wax without fluourocarbons, and we think people should seek out similar products for their skis and snowboards. Have a look at the full review and list of eco--friendly wax companies we found. The environment and your body will thank you! The Renoun Citadel 106 is the only ski two of our testers immediately preordered for next-season delivery as soon as they tested it. That was a bit shocking and unusual for our typically skeptical crew. The Citadel is Cyrus Schenck's "Ski I Wanted To Build For 3 Years" design with twice the volume of non-Newtonian "HDT" polymer of previous models. Put simply, this is one of the most impressive skis we have tested in 13 years because it is disturbingly light, yet super-stable, confident, downright ripping at GS turns on hardpack and easy-peasy fun in powder and mixed conditions with a surprisingly playful and zero-effort level of input needed from the skier. While the price tag of $1,499 usd for a pair of skis is reaching the limit of what typical skiers will pay for a set of skis, the Citadel is backed with an eye-opening "Try-them-for-100-days-and-return-them-for-a-refund" no-risk purchase policy and two year warranty against defects. That's how confident Renoun is its product. We recommend people read the full review HERE and check out the photos. We think the level of performance people should expect from freeride skis has just been increased significantly by Renoun's new Citadel release. This means more fun for more skiers, especially if Cyrus licenses the technology to other ski companies...(hint, hint...). Save your nickels, because you might want to save up for a pair of these. Two of our testers didn't hesitate to preorder their pairs last Spring for delivery this winter! 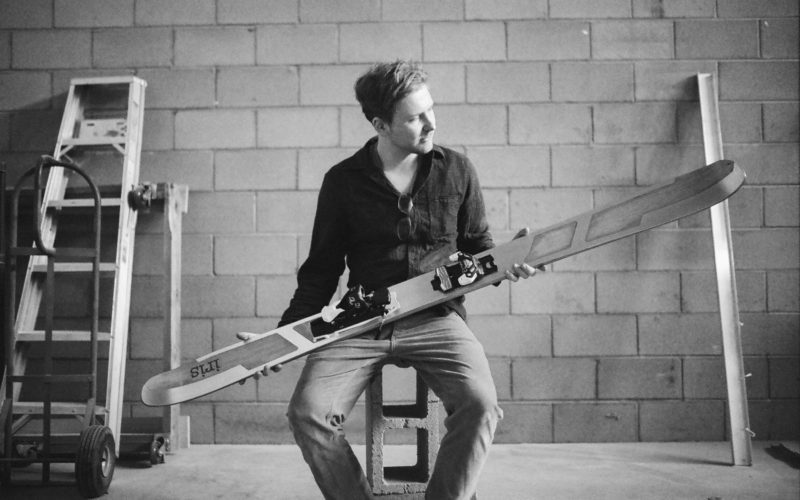 Cyrus Shenck - Founder, Renoun Skis.